and audiovisual support staff; concierge services. including a craft brewery; valet or self-parking for a fee; and covered garage. The best of California meetings and events come to life at the AAA Four Diamond Portola Hotel & Spa, located steps from Fisherman’s Wharf in the heart of downtown Monterey. This perfect coastal venue welcomes guests with a modern, tree-lined lobby that is designed to reflect the best of California coastal luxury. As one of the first LEED-certified hotels on the state’s Central Coast, the Portola features 379 guest rooms and suites. In addition, it offers 60,000 square feet of flexible indoor and outdoor meeting space with the adjacent, newly renovated Monterey Conference Center. As the region’s largest and most diverse conference facility, the Portola Hotel can accommodate groups and events of all sizes, including small and large conferences, eco-friendly events, board meetings, product launches, galas, and more. The Portola Hotel features a dedicated 1-gigabit internet connection, as well as an onsite event technology staff. Seasoned sales, catering, and convention services teams are available every step of the way to ensure that any meeting or event is a success. Other amenities include an award-winning day spa, a 24-hour fitness center, and four onsite dining experiences, including a craft brewery and Peet’s Coffee. The hotel also recently added an expansive terrace with fire pits and living walls for outdoor dining and special events. When it’s time to explore, the Portola’s central location lets guests walk to beaches, coastal recreation trails, shops, wine tasting rooms, galleries, and more. Portola Hotel & Spa offers a convenient solution for planners. It has the best location in Monterey—adjacent to the conference center and a wide variety of shops and restaurants. 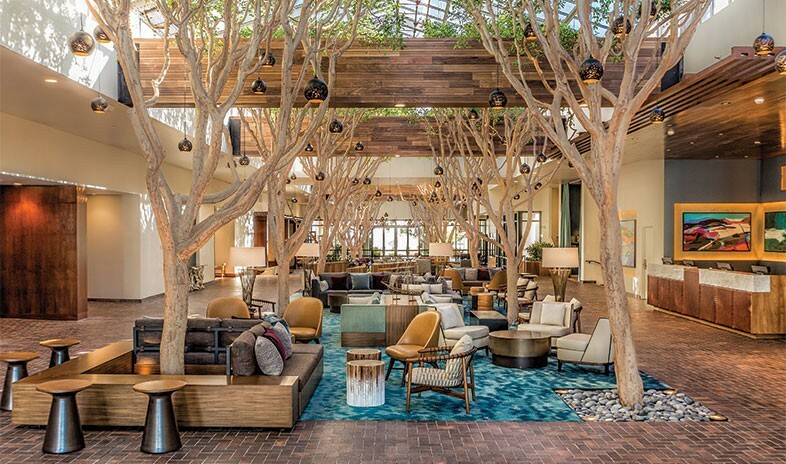 Monterey, California – November 17, 2016 — The AAA Four Diamond Portola Hotel & Spa, overlooking Monterey Bay and Fisherman’s Wharf, announced plans for a complete renovation of its tree-lined atrium lobby, together with construction of a new $3.5 million entrance plaza and 40,000 square foot Monterey Conference Center. The $6 million reimaged lobby will feature extensive use of wood complimented by lighted pendants in the 25-foot lobby ficus trees, as well as, a new bar and lobby seating providing a unique ambience for food and bar service. “The ongoing and future property renovations are part of our commitment to our guests, to offer an exceptional stay in one of the most beautiful ocean-side destinations on the California coast,” said Janine Chicourrat, General Manager of the property. In addition to the current upgrades, the Portola has recently completed a $10 million full renovation of all their 379 guestrooms and bathrooms. Two world renowned firms have been selected as the design partners. The San Francisco-based Puccini Group is the interior-design partner for the Portola lobby enhancements. Skidmore, Owings & Merrill is the designer for the 35,000-square foot entrance plaza and the $60 million conference space. Both the plaza and conference center are being constructed by the City of Monterey, through a long-standing private/public partnership with Portola. These improvements, include cutting-edge energy and water conservation fixtures, reinforcing the Portola’s commitment to green practices and its U.S. Building Council’s LEED® Certified Status. The Conference Center will also seek LEED Certified Status upon completion. All three projects are scheduled for completion in April, 2017. During the renovation process, Portola will remain open for business. Los Angeles, CA, April 1, 2015 – Portola Hotel & Spa, which currently holds the U.S. Green Building Council’s (USGBC) Silver LEED® certification for Existing Buildings Operations and Maintenance, has completed the highly esteemed recertification process. As the first LEED® hotel in Central California, Portola Hotel & Spa takes much pride in providing both eco-friendly and superior services and amenities to their guests. Portola Hotel & Spa was the very first hotel to undergo the recertification process, and participated in the USGBC’s Recertification Beta Pilot Program, which has a specific team focused on the hospitality industry. •	Almost 20% of the hotel’s employees commute using alternative forms of transportation including biking, walking, and public transit. •	Native and adaptive plants that are drought-tolerant and provide habitat are placed throughout the property. •	In order to eliminate the hotel’s contribution to ozone depletion, all refrigerants containing CFCs have been phased out. •	Portola Hotel has purchased Renewable Energy Credits equivalent to 100% of yearly energy, which supports renewable energy generation offsite. •	At least 25% of food purchases are local or sustainable. Portola Hotel is diverting approximately 78% of waste from landfills and conducts an annual waste audit to identify areas that can be further approved. To ensure a healthy and productive environment for the Portola Hotel staff and guests, an annual survey on occupant comfort and general cleanliness is conducted. Portola Hotel & Spa is Monterey's first and only Silver LEED® EB certified hotel and AAA Four Diamond Rating. The full-service hotel offers guests a rich, historical ambiance, with residential style and a dedicated staff to ensure an unparalleled guest experience. The hotel features 379 nautically inspired guest rooms and suites, ranging from 400 to 1,000 square feet.